I love pancakes. It’s my perfect Saturday morning breakfast, and these are the best. They are fluffy and buttery with tart blueberries. Most pancakes recipes have the standard ingredients, slightly tweaked here and there. What I have found that makes these pancakes stand out are three things: the melted butter in the batter. It gives it a sweet buttery flavour. The baking powder, this recipe calls for almost double what most pancake recipes have. This is what makes them really fluffy. And finally the fresh blueberries. I do not skimp on these beautiful bombs of flavour that burst in your mouth with every bite. And of course, pancakes are just not complete unless they are drenched in maple syrup. Rinse blueberries and let dry in a colander. In a big mixing bowl, add the dry ingredients – flour, sugar, salt, baking powder and soda. Mix well with a whisk. In a smaller bowl, add the wet ingredients – buttermilk, egg, melted butter, vanilla. Mix well. It may look curdled but that’s okay. Combine wet ingredients with the dry ingredients. Mix about 15 times until batter has formed and there are no lumps. Do not over mix. Have frying pan on medium – low heat. Grease frying pan with butter. Note: each time you make a pancake grease the pan, this will make them crispy on the outside. Using a 1/3 cup measure, dollop batter onto pan. 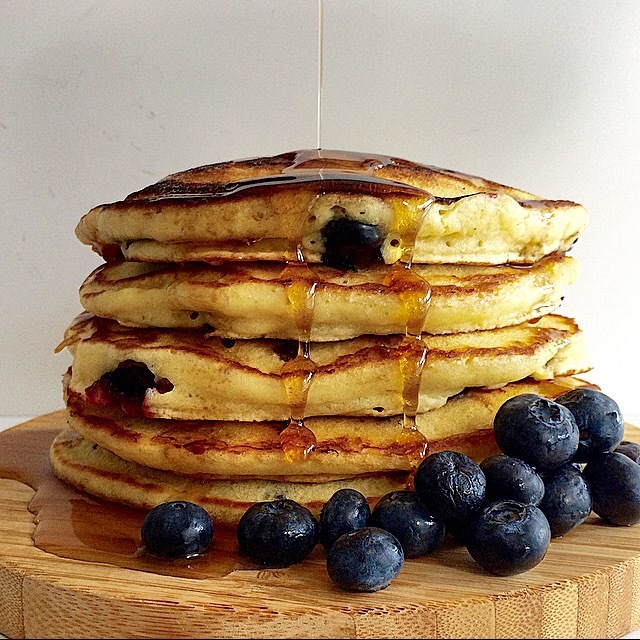 Place fresh blueberries on pancake. You can put as many as you like. I put a lot because I like there to be a blueberry in every bite. When bubbles start to appear flip over. Let cook for about 2 minutes. Remove from pan and eat while hot. These pancakes can be topped with lemon curd or whipped cream, even a fruit compote. But to me, the best is pure maple syrup. If blueberries are not your thing, leave them out, the pancakes are just as good. Other fruit? Yes, but not watery fruit. I would stick to berries, and they have to be fresh. Frozen become too watery in the batter. With fresh berries, they burst when you flip the pancake over and fry them.